Home / Fun Friday: We’re Oklahoma’s third-best small company to work for! 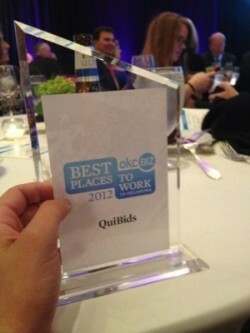 About a month ago we told you that QuiBids made the shortlist for one of Oklahoma’s Best Places to work! Well, we’re excited to announce that we took third place in the small company category at last night’s banquet, hosted by okcBIZ magazine! It’s a little step forward from last year’s fourth-place finish, but we couldn’t be more excited to be honored by our peers in the Oklahoma City business world. Thanks again to okcBIZ for hosting the annual Best Places to Work competition! Be sure to pick up a copy of their July issue to read their profile on us! If you’re not in OKC, you can read it over at their website! But most importantly thank you customers for helping us build QuiBids into one of the state’s top businesses! We couldn’t have done it without you!